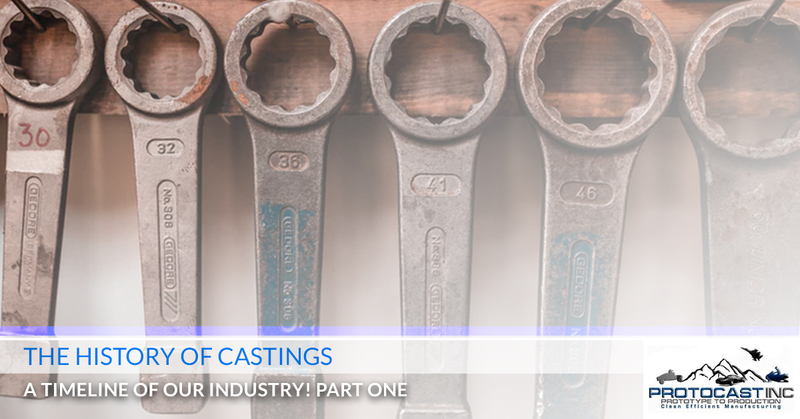 The History Of Castings - A Timeline Of Our Industry! | Protocast Inc.
Protocast Inc. is your one-stop-shop in Denver for all things metal casting. From prototype to production, we specialize in aluminum, zinc, and magnesium cast along with CNC machined parts for industries such as oil and gas, robotics, medical, defense, aerospace, automotive, and beyond. Below you’ll find a summary of each of our bread-and-butter services we employ at our Denver metal shop. Toolmaking – if it looks like you’ll be needing to endure longer-than-expected lead times, we have experienced engineers who will cut matchplate tooling in a matter of days or weeks. Depending on the size, we’ll be able to speed up the process in a significant way. Machined Parts – We boast operators and engineers who are able to produce high-quality machined parts according to customer specifications with our full-line machine shop. Aluminum Heat Treating – With our innovative — and downright impressive — furnace, we utilize an in-house treatment system, which allows us to treat almost every aluminum casting-project within a week. Though the particulars of each project might cause this “ballpark” timeframe to be longer or shorter, by and large we are able to meet most deadlines given our skill and commitment to customer satisfaction. That’s what makes Protocast Inc. one of the top metal shops in the entire state of Colorado! Casting Processes – We offer seven different casting processes that make it possible for us to manufacture a wide range of parts in a short period of time. These casting processes include rubber plaster mold casting, rapid investment casting, machining, precision sand casting, printed sand mold process, permanent mold casting, die casting, and aluminum heat treatment. As fun as it is to highlight our casting services, processes, and toolmaking capabilities, that is not what today’s post concerns. As the title no doubt gave away, we will be discussing the history of castings in today’s post. So whether you are interested in educating yourself about metal castings for your genuine pursuit of knowledge or you are interested in finding a machine shop in Denver worth their salt, keep reading! This post is for you. Before we talk about the history of something, it would probably be helpful to inform our readers what exactly the manufacturing process known as casting actually is. Casting is a process which involves taking a liquid material being poured into a mold of some sort. In this mold is a cavity of whatever eventual shape of the product will be. Once the liquid material cools, it will solidify into a part called a casting. Epoxy, plaster, concrete, and clay are all examples of cold setting casting materials that are cured after two components are blended. However, we at Protcast Inc. deal with metal castings. And in metalworking, the metal will be heated until it turns into a liquid, whereupon it’s poured into a given mold. Metal casting molds include runners and risers which allow the metal to fill up the mold. While any kind of metal can be cast, the most commonly used metals include steel, aluminum, copper-based alloys, and iron. Castings can vary in weight in a fairly significant way — from less than an ounce to an individual part weighing over 100 tons! For the record, if you have a project of that magnitude you’d like us to complete, it might take more than a few days, just so everyone is aware! Before we talk about the earliest castings on record, we’d be remiss if we failed to mention the mythology behind casting in the first place. Throughout prehistoric times, ancient legends of the gods of the foundry and volcanoes, Hephaestus and Vulcan, were deities who made thunder crack for the very first time and shaping novel weapons with hammers for their cohorts. Humans were said to have stolen fire from these gods, for obvious reasons, one of them being so we could create our own foundry, which can be described being anywhere that a metal workshop could be found. In these foundries, humans made metal soft and malleable, which allowed mankind to turn base metals into bronze and other useful casts. Speaking more factually on the matter, the Fertile Crescent, the region between the Tigris and Euphrates Rivers that is also called Mesopotamia (modern-day Iraq), is where the furnace and foundry got their beginnings. Starting with clay casts made from hot fire pits used to help shape copper, silver, and gold, the casting methods became more advanced over time. While early castings typically involved copper to make more sophisticated casts, a breakthrough occurred when these early metalworkers started using tin. Tin had the unique effect of reducing the temperature at which two different metals could be melted together to form bronze — which happens to be the first alloy ever made by humans. As the centuries past, many people groups began to settle down in permanent locations, forgoing the nomad culture of their ancestors. This newfound permanence led to the capacity for smiths to improve their craft from generation to generation, along with an improved dedication to the craft of mining. This is when the founding industry got its proper beginnings, as blacksmith shops opened in cities and towns. These smiths, using manually operated bellows and pipes that you’ve probably seen in the movies, behooved many industries beyond that of warfare, as farmers were able to utilize inventive instruments to improve the efficiency and quality of their work. Now that we’ve covered the early beginnings of casting and foundries, we will offer up a timeline of significant breakthroughs concerning metal casting and its advancements. 3200 B.C – The oldest known casting on record is cast in Mesopotamia. The copper frog is still in existence today. 700 B.C. – The very first Chinese production of cast iron occured, along with the earliest known sand molding, which was also administered by the Chinese. 233 B.C. – The first known cast iron plowshares are poured and cast in China. Something is starting to tell us the Chinese were fairly advanced! 500 A.D – Interestingly, cast crucible steel is made in India, but somehow knowledge of the process was lost. Amazingly, no one was able to duplicate the production of crucible steel until Benjamin Huntsman, an Englishman, was able to do so in 1750. 1455 – The inaugural cast iron pipe is made in Dillenburg Castle in Germany. It was used to transport water from one place to the next. 1480 – Vannoccio Biringuccio, known as the father of the foundry industry by many, is the first person to record his methodology in writing. Obviously, we are very grateful here at Protocast Inc. for Vannoccio’s commitment to documentation. 1642 – Saugus Iron Works is established in Lynn, MA. The United States’ first iron foundry was home of the very first American iron casting, the Saugus pot. Early 1700s – The Brit Abraham Darby makes the original foundry flask for san and loam molding. Darby also was the first person to use coke, a coal derivative that occurs from the distillation of bituminous coal without the presence of air, at his metal furnace in Coalbrookdale, England. 1750 – As we noted above, Benjamin Huntsman duplicates the process of cast crucible steel. This process involves melting steel, which results in a uniform composition of the molten steel. This affords the ability to produce alloy steel because the necessary elements for casting an alloy can be included in the crucible while the steel is molten. Previously, steel had never reached a molten state. 1794 – The Cupola is used for the first time in iron founding, a process invested by John Wilkinson. As it turns out, we will need to split this topic into a two-part series, seeing as how we weren’t able to get past the 18th century! That being said, keep an eye out for part two, in which we’ll highlight the significant metalworking events of the 19th and 20th centuries. In the meantime, make sure you contact us if you are in need of clean, efficient manufacturing in the Denver area. We offer permanent mold casting, tool cutting, die casting, and much more at our machine shop of Denver. With our experience and passion for what we do, we are confident we can bring you an affordable solution. We’d love to be a part of your next manufacturing project!